It may have been the first day of summer for students in the Menlo Park City School District, but that didn’t keep an enthusiastic group of them away from the school board meeting last night. 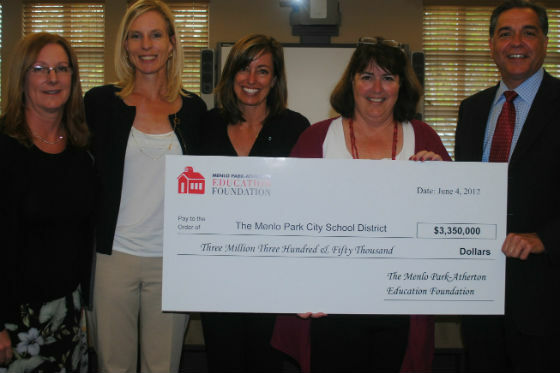 The kids — representing the District’s four schools of Laurel, Encinal, Oak Knoll, and Hillview — helped present the District with a giant check from the Menlo Park-Atherton Education Foundation (MPAEF). And the check wasn’t the only thing that was sizable: Parents, local businesses, and community members together raised $3,350,000 for the schools through the MPAEF this year. Superintendent Dr. Maurice Ghysels pointed out that the MPAEF grant will make up more than 10% of the District’s budget for the 2012-2013 school year and will fund the salaries of 28 teachers and staff. He also called out another significant accomplishment by the MPAEF this year: 74% of District families participated in the vital fundraising efforts, demonstrating the incredible commitment of the parent community. He also thanked the MPAEF’s Executive Director Lynne Van Tilburg and Co-Presidents Theanne Thomson and Alison Leupold for their tireless efforts this year (pictured below from left to right with School Board President Laura Rich and Dr. Ghysels). Great job everyone! Thanks for the amazing and inspiring work to raise this money for our district. Thanks to all the parents, grandparents, local businesses, community members, etc. who have supported our Menlo Park City Schools! Super news! A true testament to the power of community!